That's a great question. My favorite thing to do with my used tree is to remove all of the decorations, tinsel, hooks, etc. and take it outside and place it near my bird feeders. The birds love the extra shelter the Christmas tree provides and it will work all winter long. Be sure to look for a good way to secure the base of the tree so it doesn't fall over or blow away. Before the ground freezes solid, you could dig it in or perhaps tie it to a building or tie it to stakes in the ground. If your tree stand is sturdy, leave it in the stand outside all winter. After you have secured the tree firmly, a really fun thing to do is to add some wildlife treats onto the branches. Birds and squirrels love pinecones stuffed with peanut butter hung from branches, popcorn threaded on strings draped around the tree, suet blocks (which come in all shapes and sizes) tied to sturdy limbs, stale bread tied with colorful ribbons, even fruit like orange wedges attached with strings. Experiment with different things and see what kinds of birds and wildlife show up. Be sure to locate your "tree buffet" near a window so you can watch all of the fun - you will have months of entertainment! 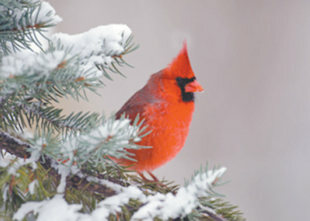 Remember to put out fresh water for the birds in the winter. Even though the water will eventually freeze, keep replacing it so the birds have a steady supply of drinking water. If you have rabbits around, lay your tree down on its side and it will provide shelter for the rabbits all winter long! Another good use for Christmas tree branches is perennial garden mulching insulation, especially if you have some perennials that are marginal in this growing zone. (Although the way this winter is going so far, it's hard to imagine any plants needing insulation from the cold!). Good luck, help wildlife and have fun all winter long!